By organizing repressions against the unloyal fraction of the Polish minority the Belarusian officials only want to test what EU's response will be, the Belarusian political analyst Vitali Silicki argues. Indeed, unlike several years ago, the regime in Minsk can't afford tearing its relations with the EU now. The moment when Russia has risen the prices for natural resources for Belarus and thereby has stopped de-facto subsidizing Belarus was the birth for a real Belarusian foreign policy. Now the Belarusian officials have to play a complex game in maneuvering between the interests of the EU and of Russia. Both EU and Russia present both danger and opportunities for president Aliaksandr Lukashenka. Both have economic resources Lukašenka needs and both threat his unlimited power in Belarus. Aliaksandr Lukašenka's aim is to realize as many opportunities as possible and to avoid the dangers. This means he cannot fully ally with neither the EU nor with Russia. Nor can he go in direct confrontation with neither of them. The EU should therefore understand and realize its ability to influence the Belarusian regime. The EU should not give Lukašenka the license to continue repressions but should instead give a clear signal that human rights violations in Belarus will not be tolerated. Minsk's general tendency in recent weeks has been to accommodate its EU neighbours. For example, at the request of Lithuanian prosecutors, the Belarusian authorities have interrogated a serving general, Valery Uskhopchik, for his role – as commander of the Soviet garrison in Vilnius – in the massacre of January 1991 during the Moscow-backed attempt to end Lithuania's self-declared independence from the Soviet Union. Such unusual co-operation suggests Minsk needs more friends in the EU. And no wonder, since financial assistance from the EU to Belarus requires the unanimous backing of the EU's member states. Moreover, the current conflict has already cost Belarus money: the European Bank for Reconstruction and Development put all projects in Belarus on hold until this episode is resolved. This episode does not mean the EU's policy of dialogue has failed. It does, though, show that Belarus takes the EU's current strategy – dialogue coupled with concessions and soft, cajoling words – as a licence to unleash repression whenever it wants or needs. Solidarity and support from European civil society is crucial for democratic forces in Belarus. Belarus is indeed the last Eastern European country that has not joined the Free World after the breakdown of the totalitarian Socialist camp. It is one of the few countries of the region that have not joined the NATO and the EU and where the situation with democracy and human rights is still much worse than in other European countries. Apart from that, Belarus is also one of the least known countries in the West. Actions like the one organized by the Young European Federalists are probably even more important than uncountable resolutions by the OSCE and the European Parliament. It is important not only to appeal to European politicians to have a firm position on Belarus, but also to inform the society in the EU about problems in its closest neighbour Belarus. On the night of 18th March 2010 the Young European Federalists, political movement active in most European countries, and its global partners protested against Europe's last standing dictatorship. The event was dedicated to the fourth anniversary of the disputed presidential elections in Belarus. 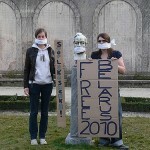 The fifth consecutive "Free Belarus Action" took place in 125 cities on four continents, including cities in almost all European countries, including Belarus. The Young European Federalists' collected signatures in the streets and posed with with signs reading "Give the people of Belarus a voice" in protest against Lukashenka's dictatorship. The current Belarus political regime has deprived 10 million Belarusian citizens deprived of fundamental human rights, including the right to free speech. "Free Belarus means: when Belarus is free from the death penalty, celebrates good human rights, there is freedom of speech for all its citizens, freedom of press and NGOs and a process where the freedom of electing one's leadership in the elections is truly democratic – only then can we speak of a united, strong, and fair Europe," said JEF-Europe President Philippe Adriaenssens. "The European Union that JEF believes in is one with a clear foreign policy – not one turning a blind eye to human rights violations happening at its doorstep." "Actions speak louder than words," continued Free Belarus Action coordinator Elisabeth Velle," yet every year we hope it will be the last time we have to organise this action.'' "Condemning a regime is not enough. The European Union should do everything in its power to support civil society within the Belarusian borders, make sure that the next general elections are under full observation of election monitors and guarantee the freedom of the press and political opinion. 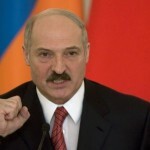 Moreover, it is time that the suspension of sanctions on Lukashenko and his officials were lifted. Europe must send out the message that its core values do not allow it to silently tolerate human rights violations and that it in no way supports Belarusian dictatorship." "We urge European Commission Vice-President and High Representative for Foreign Affairs and Security Policy Catherine Ashton to foster greater co-operation between Member States and European Institutions, and to assist Europe in releasing the people of Belarus from the dictatorial grip. This way, Belarus can be on its way to join the democracies of Europe," concluded Adriaenssens. For participating in the action, three young Russian activists, also associated with the youth branch of the Yabloko (The Russian United Democratic Party), were arrested and imprisoned in the Russian cit of Omsk. Facing an unexpected early morning wakeup call in a harsh Russian prison, the three campaigners of conscious now face a number of augmented charges, including vandalism and public disorder, which considering that no statues were damaged or public unrest was caused, is somewhat ludicrous. See a press release on the JEF website, see photos from the action here.